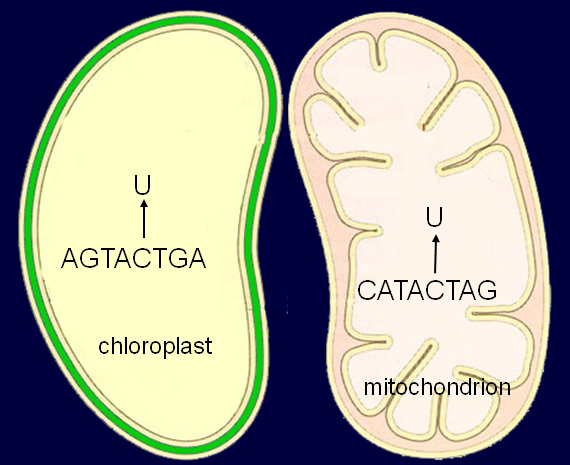 Particular cytidines in transcripts in chloroplasts and mitochondria of plant cells undergo modification to uridine by RNA editing (1). These C-to-U changes can create start and stop codons or change the encoded amino acid from the one predicted from the genomic sequence. RNA editing is known to occur in a variety of organisms, including mammals, insects, plants and microorganisms. In humans and other animals, RNA editing creates diversity in certain classes of proteins encoded by the nuclear genome. Editing in plants appears to correct defective RNA post-transcriptionally. We have also used chloroplast extracts capable of editing exogenous RNA (5-7) to probe the features of transcripts that are important in RNA editing. Regions surrounding chloroplast editing sites could be mutated in vitro and RNA transcribed from mutated templates. These RNAs could be introduced into chloroplast extracts and the extent of conversion of C to U was assayed. Some members of the PPR protein family contain a DYW domain at the C-terminus. This domain has been hypothesized to provide the enzymatic activity needed to convert C to U because it carries motifs characteristic of cytidine deaminases. We performed site-specific mutagenesis of these motifs in two PPR proteins and demonstrated that editing activity was lost. (11) This finding supports the idea that DYW domains carry cytidine deaminase activity. 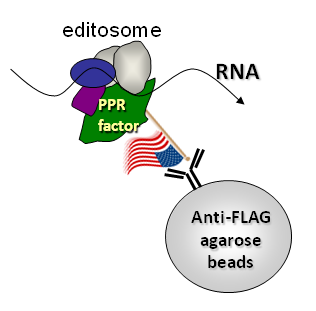 An important breakthrough in our efforts to identify additional nuclear-encoded components of the editosome resulted from immunoprecipitation of a FLAG-tagged PPR protein, RARE1, followed by mass spectrometric analysis by the collaborating lab of Klaas Van Wijk (Cornell Section of Plant Biology). Further analysis of a candidate protein resulted in the identification of RIP1 as a dual-targeted protein that affects RNA editing in both chloroplasts and mitochondria (12). The STS-PCRseq method pioneered by Stephane Bentolila provides a global method to analyze RNA editing in plant mitochondrial and chloroplast transcripts, and can be adapted for use in any biological system in order to sequence a selected subset of transcripts. A protocol for application of the method to Arabidopsis organelle transcripts can be found here. 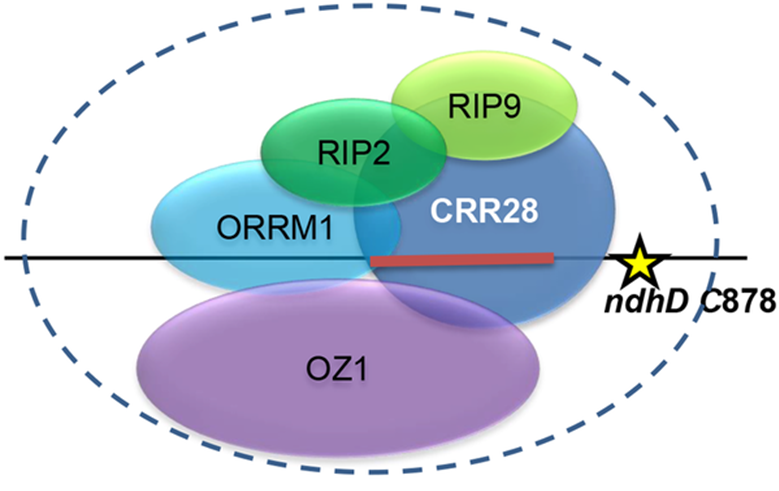 Homology search revealed that a protein that we have named ORRM1 (Organelle RRM-domain containing protein 1) contained domains characteristic of the RIP family, but also exhibited an RNA Recognition Motif (RRM), unlike any of the RIP proteins. 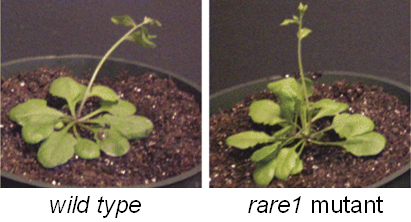 (15) An Arabidopsis orrm1 mutant exhibited defects in editing of multiple chloroplast editing sites. 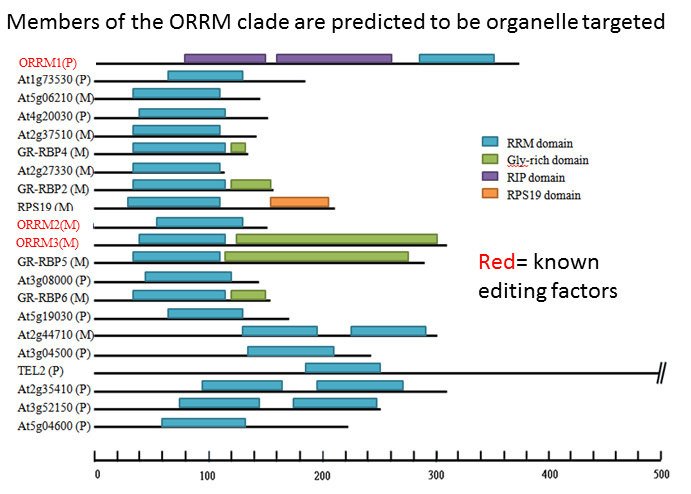 ORRM1 belongs to a clade within the large RRM family of Arabidopsis proteins. We have identified another family required for RNA editing by immunoprecipitating ORRM1 and performing proteomic analysis in collaboration with the Van Wijk lab. We identified the protein Organelle Zinc Finger Protein 1 (OZ1) as required for editing of 14 targets in Arabidopsis. (17) Arabidopsis contains three additional members of the zinc finger family, all predicted to be targeted to organelles. The recent identification of additional nuclear-encoded proteins that are involved in editing in either chloroplasts or mitochondria, or in both organelles, has complicated our view of the molecular apparatus for RNA editing. Further work should complete the picture of the multiple configurations of RNA editosomes which are required to convert Cs to Us in plant organelles. 1. Stern, D. B., Goldschmidt-Clermont, M., and Hanson, M. R. (2010) Chloroplast RNA metabolism. 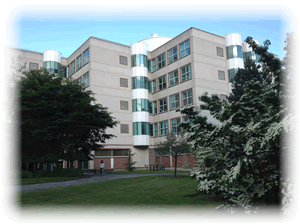 Annual Rev Plant Biol 61, 125-155. 2. Reed, M. L., and Hanson, M. R. (1997) A heterologous maize rpoB editing site is recognized by transgenic tobacco chloroplasts. Mol Cell Biol 17, 6948-6952. 3. Reed, M. L., Lyi, S. M., and Hanson, M. R. (2001) Edited transcripts compete with unedited mRNAs for trans-acting editing factors in higher plant chloroplasts. Gene 272, 165-171. 4. 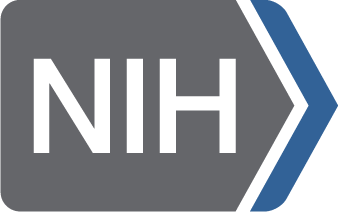 Reed, M. L., Peeters, N. M., and Hanson, M. R. (2001) A single alteration 20 nt 5' to an editing target inhibits chloroplast RNA editing in vivo. Nucleic Acids Res 29, 1507-1513. 5. Hegeman, C. E., Hayes, M. L., and Hanson, M. R. (2005) Substrate and cofactor requirements for RNA editing of chloroplast transcripts in Arabidopsis in vitro. Plant Journal 42, 124-132. 6. Heller, W. P., Hayes, M. L., and Hanson, M. R. (2008) Cross-competition in editing of chloroplast RNA transcripts in vitro implicates sharing of trans-factors between different C targets, J Biol Chem 283, 7314-7319. 7. Hayes, M. L., and Hanson, M. R. (2007) Identification of a sequence motif critical for editing of a tobacco chloroplast transcript. RNA 13, 281-288. 8. Bentolila, S., Babina, A. M., Germain, A., and Hanson, M. R. (2013) Quantitative trait locus mapping identifies REME2, a PPR-DYW protein required for editing of specific C targets in Arabidopsis mitochondria. RNA Biol 10. 9. 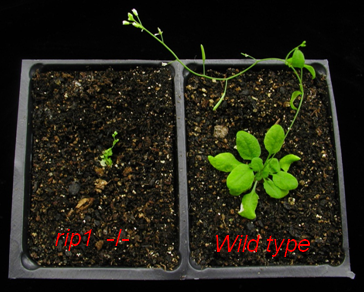 Bentolila, S., Knight, W., and Hanson, M. (2010) Natural variation in Arabidopsis leads to the identification of REME1, a pentatricopeptide repeat-DYW protein controlling the editing of mitochondrial transcripts, Plant physiology 154, 1966-1982. 10. Robbins, J. C., Heller, W. P., and Hanson, M. R. (2009) A comparative genomics approach identifies a PPR-DYW protein that is essential for C-to-U editing of the Arabidopsis chloroplast accD transcript. RNA 15, 1142-1153. 11. Wagoner, J.A., Sun, T., Lin, L., Hanson, M.R. (2015) Cytidine deaminase motifs within the DYW domain of two pentatricopeptide repeat-containing proteins are required for site- specific chloroplast RNA editing. J Biol Chem 290:2957-68. 12. 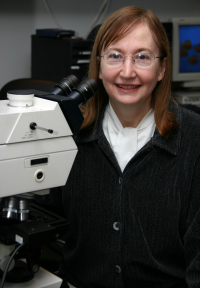 Bentolila, S., Heller, W. P., Sun, T., Babina, A. M., Friso, G., van Wijk, K. J., and Hanson, M. R. (2012) RIP1, a member of an Arabidopsis protein family, interacts with the protein RARE1 and broadly affects RNA editing. Proc Natl Acad Sci USA 109, E1453-1461. 13. Bentolila, S., Oh, J., Hanson, M. R., and Bukowski, R. (2013) Comprehensive high-resolution analysis of the role of an Arabidopsis gene family in RNA editing, PLoS Genetics 9, e1003584. 14. Germain A, Hanson MR, Bentolila S (2015) High‐throughput quantification of chloroplast RNA editing extent using Multiplex RT‐PCR Mass Spectrometry (MRMS). Plant Journal 83:546-54. 15. Sun, T., Germain, A., Giloteaux, L., Hammani, K., Barkan, A., Hanson, M. R., and Bentolila, S. (2013) An RNA recognition motif-containing protein is required for plastid RNA editing in Arabidopsis and maize. Proc Natl Acad Sci USA 110, E1169-1178. 17. Sun T, Shi X, Friso G, Van Wijk K, Bentolila S, Hanson MR. (2015) A zinc finger motif-containing protein is essential for chloroplast RNA editing. PLoS Genet. 11:e1005028.